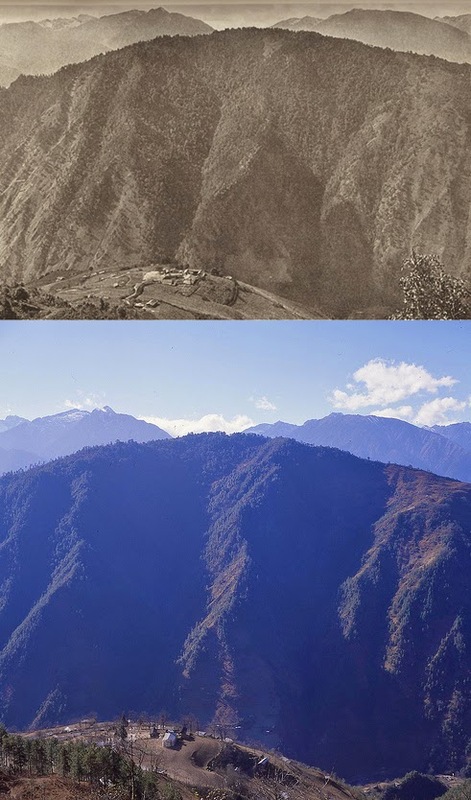 From Cizhong, Joseph Rock's exploration of the "Great River Trenches of Asia" took him westwards over the mountain divide to the Salween river [now known as the Nujiang, 怒江], crossing via the 15,000 foot high Sila pass. He spent several weeks in the Salween valley, exploring the monasteries and towns there as well as plant collecting. He then returned east to the Mekong via a treacherous gully called the Londre gorge. And finally, Rock made another trip back up the mountain divide between the Mekong and the Salween, this time to climb up to the now famous Doker La [多克拉] pass, which is part of the Tibetan pilgrimage trail that traditionally marks the border point between Yunnan and Tibet. 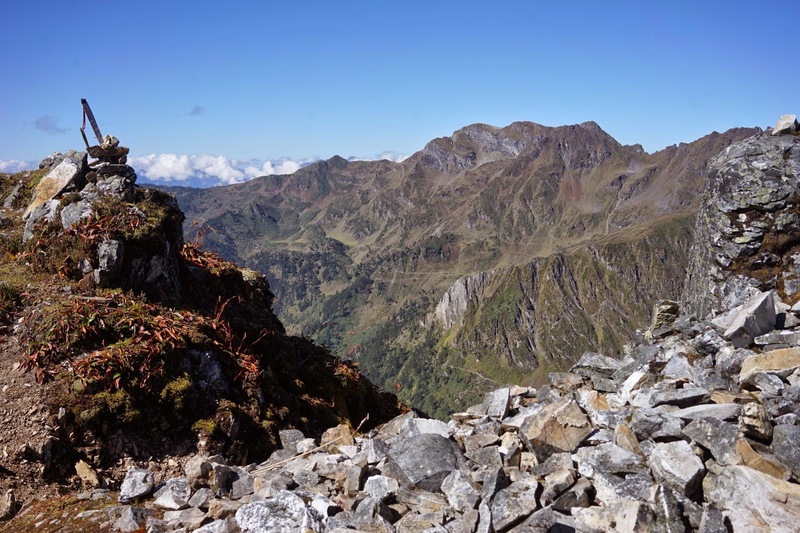 At the Doker-La he caught glimpses of the southern end of the 6740 m Kawakarpo mountain range, which he later viewed and photographed from what is now Deqin - then known as Atuntze. I was to re-visit all of these areas on several different trips I made over the course of a few years. After my initial 2002 visit to the Mekong river it was to six years before I returned to the area. However, I didn't visit the places explored by Rock in the same chronological order as he did. In 2008 I made an exploratory trip to the Salween (Nu Jiang) river valley by bus and jeep, accompanied by my nine year old son, Paul. On that trip I revisited several Nujiang settlements mentioned by Rock, including Champutong (now known as Bingzhongluo) in Yunnan and Tsarung (Chawalong) across the border in Tibet. 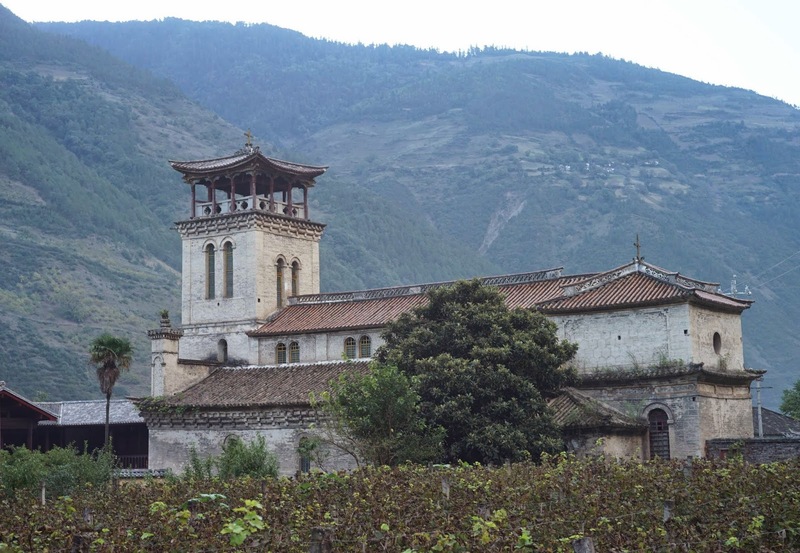 I made a return trip the following year to explore the Catholic churches and mission stations in the Nujiang mentioned by Rock including those at Bahang (Baihanluo) and Kiunatong (Qiunatong). 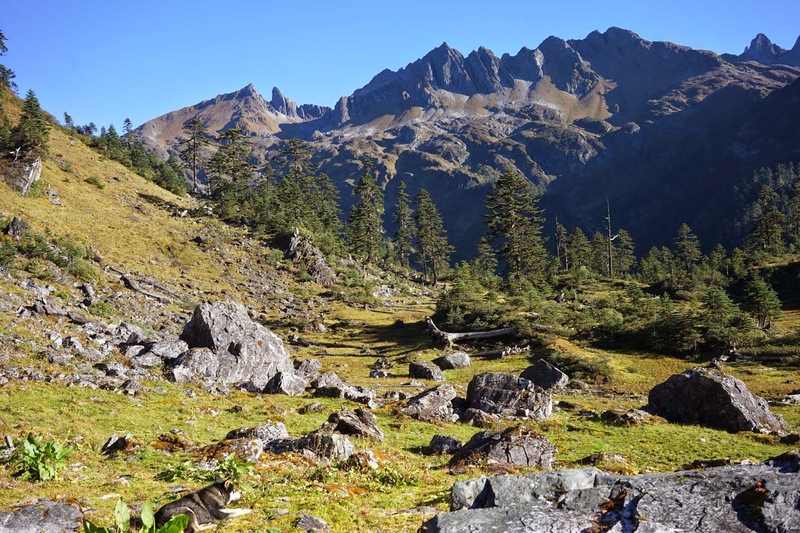 In late 2012 I returned again to hike up the Doker-La pass. And finally in 2014 I re-traced Rock's initial route from the Mekong to the Salween via the Sila pass. Rather than describe each of these trips separately, I will follow Rock's narrative and compare his accounts with my own experiences of the same areas, starting with the trip from Cizhong to the Salween via the Sila Pass. 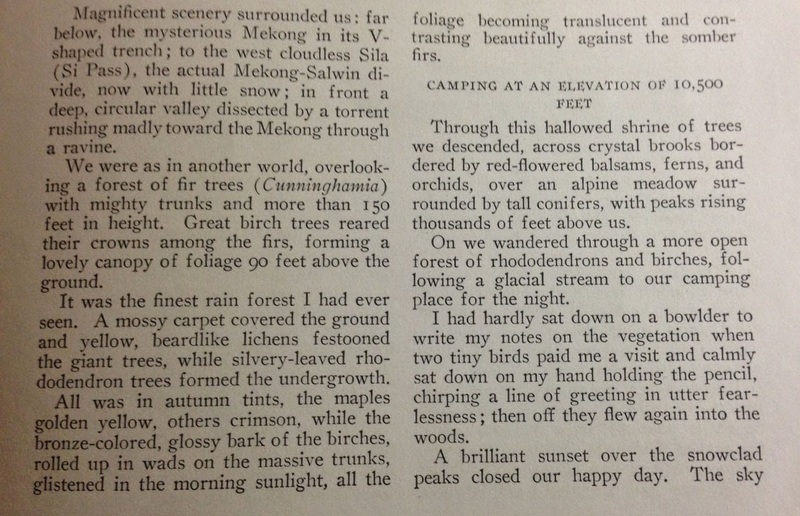 In the autumn of 1925, Rock used the Catholic church at Cizhong as his 'base camp' for a journey to the Salween. With the help of the resident French priest Father Jean-Baptiste Ouvrard (who had been at 'Tsechung' for 13 years), Rock hired 13 porters (Naxi, Tibetan and some Lutzu) to carry his gear over the Sila pass track to the Salween. He left most of his supplies behind and took only bedding, food and his camera equipment. "It was exceedingly narrow and zigzagged through scub and oak and pine forest and bowlders," he wrote. As they ascended higher: "A glorious view unfolded. Far below us roared the Mekong with the rope bride of Tseku faintly visible in the distance; to the east the massive Peimashan range, which separates the Mekong from the Yangtze." I returned to Cizhong in 2014 to follow the same track as Rock over the mountain divide to the Salween. Since my first visit 12 year earlier, transport to the area had become much easier. I flew in to Lijiang and took a coach to Deqin the next day. From the tourist village at Fei Lai Si outside Deqin I hired a minivan to take me down to Cizhong, along the might Mekong river. My plan was to repeat Rock's crossing of the Sila Pass, now known as the Selalaka (蛇拉腊卡垭口), from Cizhong (茨中) to the Catholic mission churches at Bahang (Baihanluo, 白汉洛) and Dimaluo on the Salween (Nujiang). According to Rock's National Geographic article, the journey to the Salween would involve crossing two passes: first the She-La at around 4200m and then the Balagong Pass (巴拉贡) at around 4000m. From Deqin, my minivan trip to Cizhong cost me 300 yuan and took about two hours. The route took us back through Deqin and down through the ‘new town’ section where massive and new modern government buildings have been erected, including law courts, police HQ, Party offices and a hospital and gymnasium. The road then twisted down towards the Mekong, which flowed brown and dirty through a barren landscape of huge steep and twisting canyons. Much of the road was being rebuilt, but there was little traffic on it beyond Deqin. 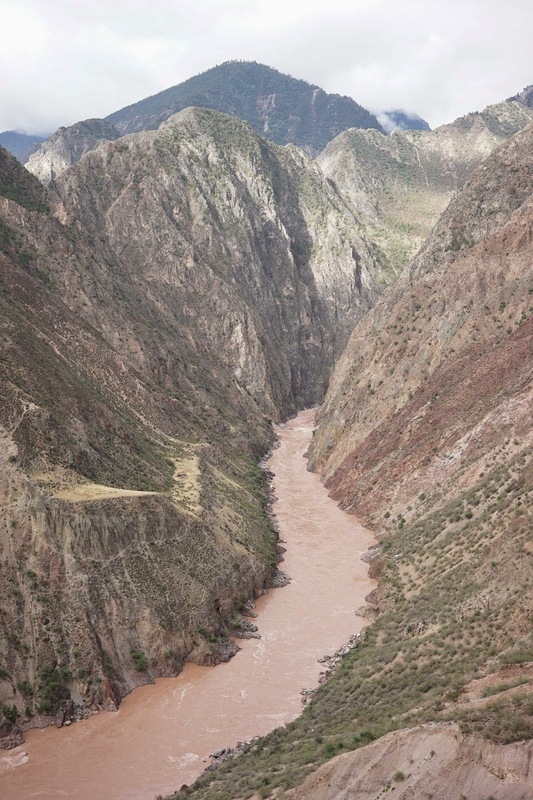 The road followed the river south along the side of the gorge, though scrappy Tibetan towns like Yanmen. We passed Chalitong, the jumping off point for Yongzhi the traditional start point for pilgrims doing the Kawakarpo kora circuit. Chalitong now has road signs indicating a road to Gongshan – the first road in this area connecting the Mekong and the Nu Jiang rivers. 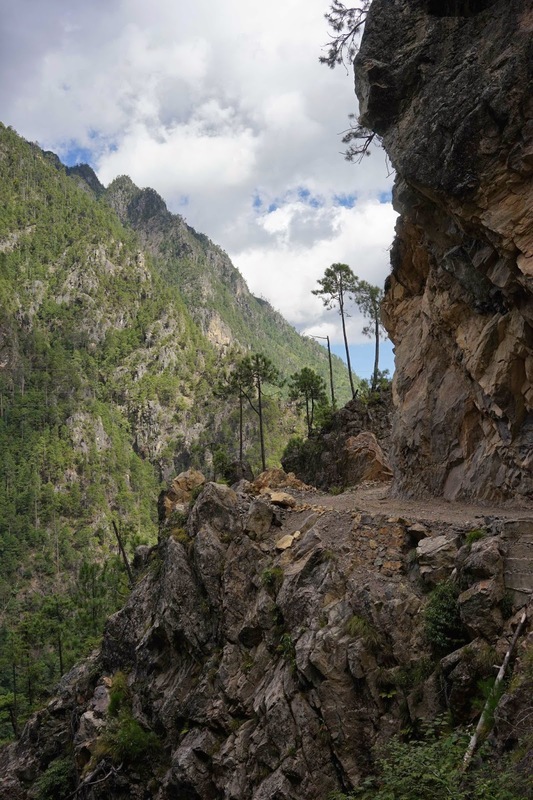 This road seemed to go through the terrible precipitous Lonjdre gorge and over the Biluo Shan pass to Dimaluo. However, the locals said the road had not yet been finished and was not driveable. I would be going the same way on foot. Cizhong was also quite a bit more developed since my last visit a decade earlier. There were now more buildings and a concrete pillar bridge was under construction over the Mekong. The scary old gravel road above the Mekong had now been obliterated and replaced with a much smoother and safer highway higher up the hillside. At Cizhong village the old French Catholic church looked unchanged, but it was now obviously seeing more visitors. The church now had a resident Chinese Catholic priest and he treated me as just another annoying tourist when I had a look around. I was offered a glass of the locally-produced wine from the church vineyard, but the priest was otherwise indifferent and seemingly bored by visitors such as me. The church now has a makeshift museum in one room, with many pictures of the old French clergy on display. I found a much warmer welcome next door at the Cizhong ‘wine centre’. 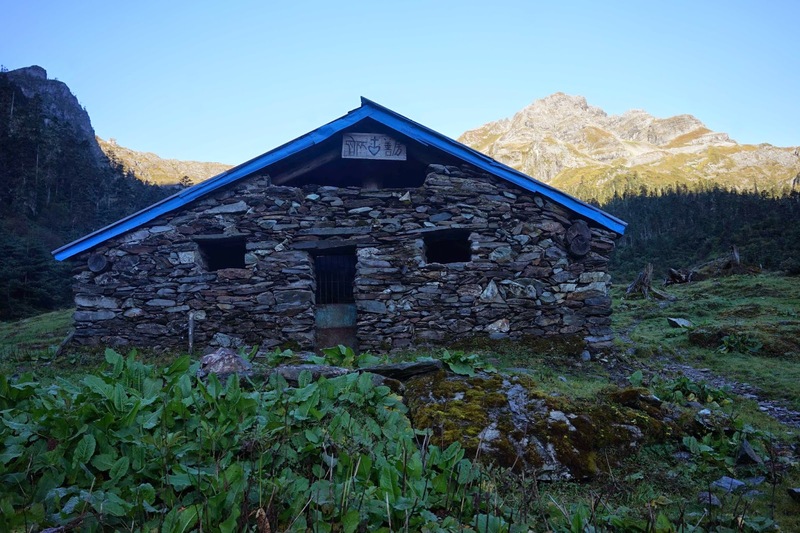 The female head of this friendly family home offered me a clean and airy room for the night, and I was soon settled in to the courtyard where I chatted with the local guys about the prospects of walking over the Si-La or She-La pass to Dimaluo. I had pre-arranged a guide across the mountains with a Tibetan tour operator Aluo, who runs a trekking agency out of Dimaluo. However, when I arrived at Cizhiong the guide was nowhere to be found, and a phone call to Aluo revealed that he had not set one up for me, despite confirming my request by phone and email. Instead, I turned to the local guys who said they could arrange a local guide for me, no problem. 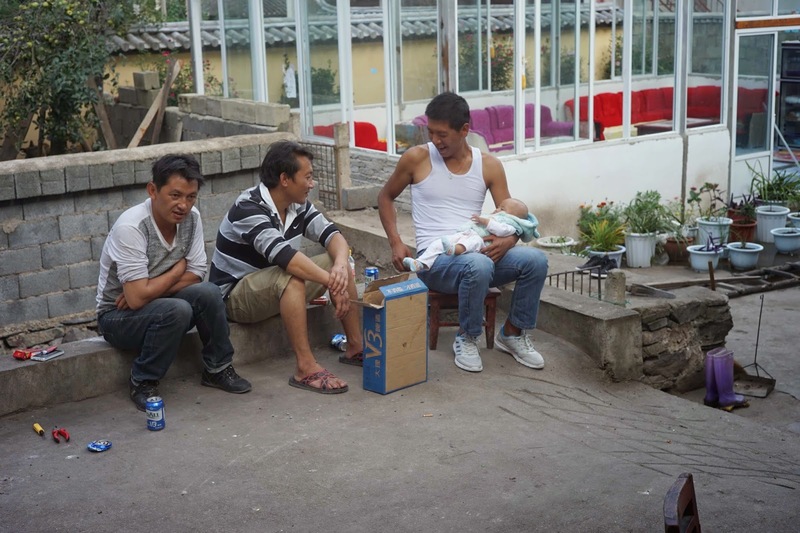 And so it was that I spent the rest of the day sat in the sunny courtyard talking to the local guys, sharing their Dali beer and Cizhong wine and getting pleasantly tipsy. To clear my head I took a walk down to the Mekong and photographed the local people gathering in and threshing the rice harvest from the fields. I also revisited the village square’ where I had taken a photo a decade earlier with some elderly locals. Sadly all of them had died in the intervening years, I was told. I also walked about a mile upriver, where I was surprised to find a newly-built posh guesthouse located next to the Buddhist stupa overlooking the Mekong. That evening over dinner of pig’s head meat, rice and potatoes (and more Dali beer) I arranged a guide for the three day trip over to Dimaluo, for a price of 400 yuan per day. The whole trip would therefore cost me 1200 yuan for a guide and horse to carry my bag. I was set to go. The crossing of the She-La was a heavenly experience that later turned in to one of the worst days of the trek, thanks to my duplicitous guide. 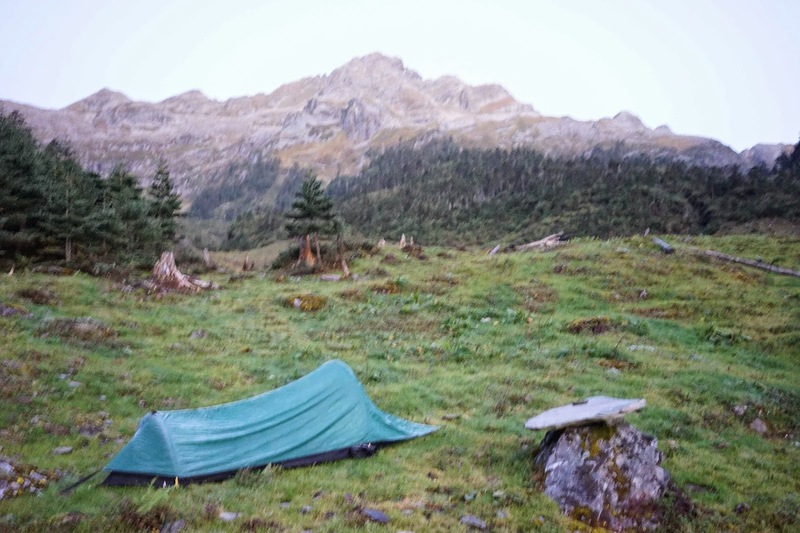 The day started well when I woke at daybreak (6.30am) in my tiny tent. I'd had a good night's sleep and the morning wasn't too cold - a light dusting of ice on the flysheet. The views up the valley towards the pass were fantastic - and the sky was completely clear - great weather for a crossing of the She-La. I managed to drag myself up and got the stove going in the stone shelter to make a cup of coffee and eat some muesli. Packed up quickly, but it still wasn't fast enough for my guide, who had upped and left about 15 minutes before me, at around 7.30am. This was to be a recurring experience with a hidden agenda that I didn't twig to until too late in the day. I was annoyed when I set off as the guide had already gone so far ahead I could not see him. This was troubling because the trail was faint in parts where it went over rocks or along the course of a stream, and route-finding was difficult. In the cold of the early morning I had donned my jacket, but soon discarded it as the sun came up and I began to sweat up the trail. I only had one bottle of water (boiled from the fire last night) and I worried this would not be enough to see me over the pass. The scenery was superb as I gradually ascended from the bottom of the ampitheatre valley to the right (north) in a series of zig-zags up towards the ridge. 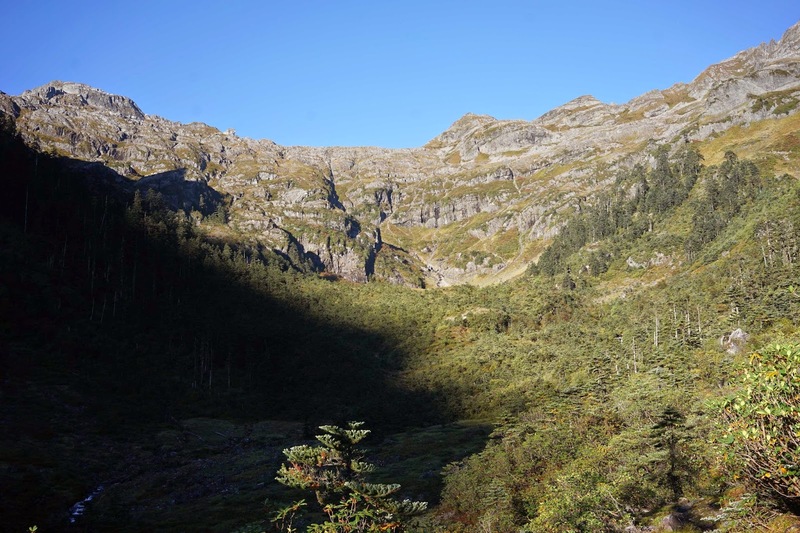 I walked through stands of giant rhododendron trees, and the grey crags that towered overhead were an epic sight in the early morning sun. After an hour or so I had worked my way up to a separate side valley that gave on to a whole series of minor peaks and crags to the north. But the trail did not go into this sanctuary, but carried on up to the west, past another decrepit log cabin and on towards the ridge. At this point I was passed by a dog that appeared out of nowhere and was intent on hurrying up to the pass. As I ascended further I gained even better views of the valley below that I had climbed out of - the track went steeply to the right and I lost the trail for a while - very frustrating as I could not see my guide for help, he had gone ahead with the horse (and my bag). I guessed the route upwards and saw what I thought was the pass above me as a cleft between grey rocks. This was a 'false summit' despite a faint track going up there, and I found the main track headed off to the left (south) and appeared to run beneath the main ridge. It then ascended again towards the broken rocks and turned over a major crag that had a few airy exposed sections: nothing to worry about in these clear conditions but it would be a worry if walking on snow and ice. 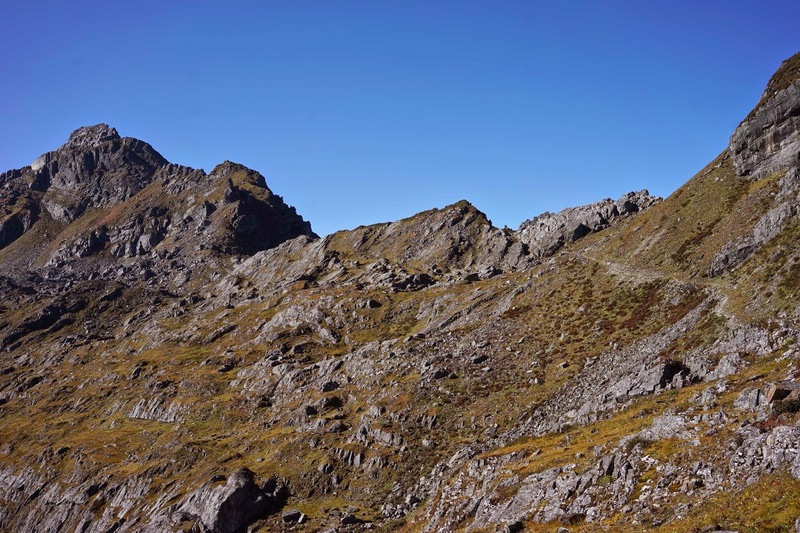 Once this high crag had been topped, the trail eased out and I could soon see ahead that the pass was close - the track eased up to what looked like a small cleft in the ride - and I paused here to take my final pictures of the Mekong side of the divide before crossing over to the Nujiang side. Once again, the views were awesome and I counted myself extremely fortunate to have perfectly clear weather. 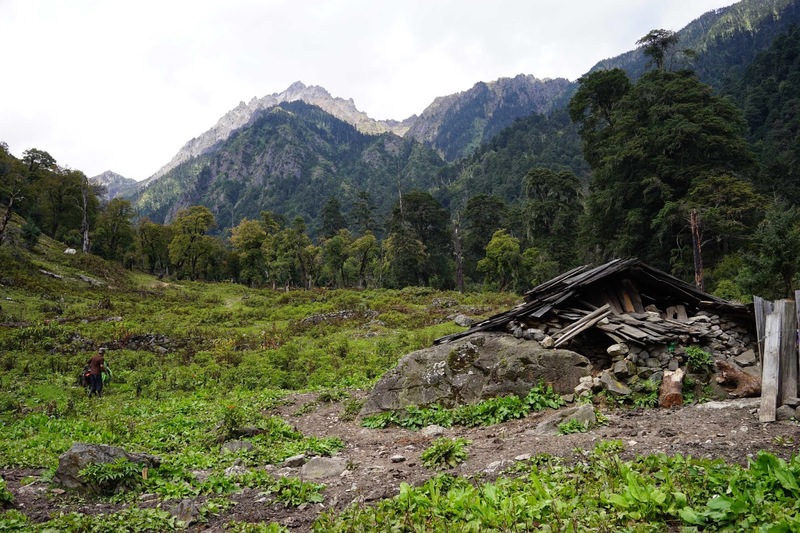 Most of the pictures I'd seen taken by other trekkers have been in cloudy and snowy conditions. I had clear views of all the surrounding peaks. 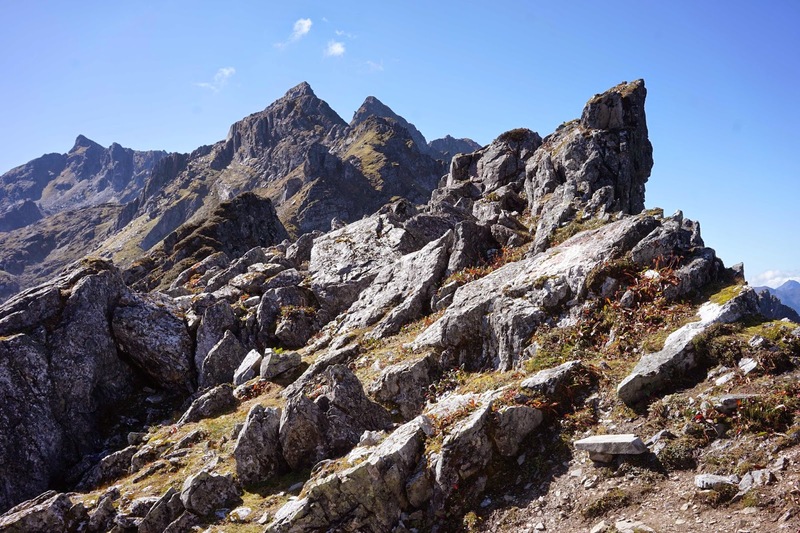 Intriguingly, however, there was no sign of the main peaks such as Miyetzimu or Kawakarpo that Rock claimed in his article that he could see from this point. The actual pass was a small gap in the ridge - perhaps only a couple of metres wide. The track descended steeply on the other side, but nothing like as scary as the Doker La pass further north. It was all quite walkable. 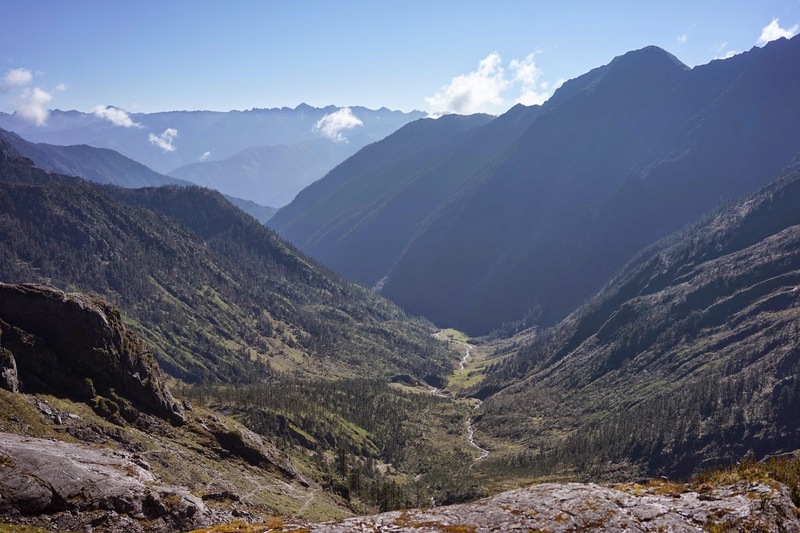 The pass provided spectacular views down into the Sewalongba valley (Chinese: Sewalong Hegu 色瓦龙河谷) below, and also across to the rocky ridge on the other side of the Sewalongba valley. 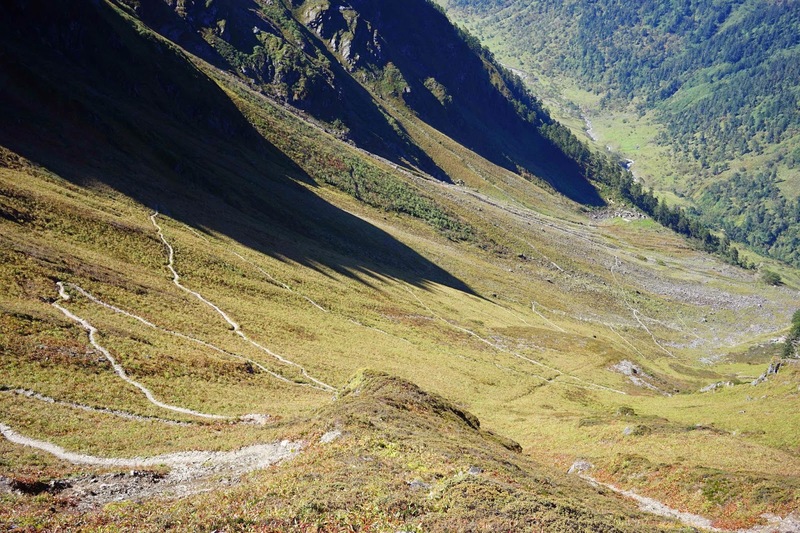 The zig-zag track down into the valley was the one built by the French and Swiss missionaries to connect their churches at Cizhong and Baihanluo (then known as Tsechung and Bahang). From the pass i could see that much of the opposite slope was forested. And somewhere across there was the second, lesser pass, the Balagong La (巴拉贡 卡口), that I would have to cross to get to Baihanluo and Dimaluo. My guide had been waiting for me at the pass, and I paused at the She La for about twenty minutes, taking photos and having a drink and a snack - it was late morning, about 11.30am. My guide didn't wait for me but headed down the zig-zag track into the Sewalangba valley. I followed him about 15 minutes later and was able to catch him up further down the switchback trail. It was here that I saw a group of Chinese trekkers on their way up. I passed them lower down the valley but they barely acknowledged my greeting. Perhaps they were as worn out as I had been during the ascent to the pass. It took about an hour to reach the valley bottom, during which time I gained great views in both directions, including a small tarn on the opposite side of the valley. Looking back up to the She-La I could barely see the pass - and the track looked a lot steeper than it really was. 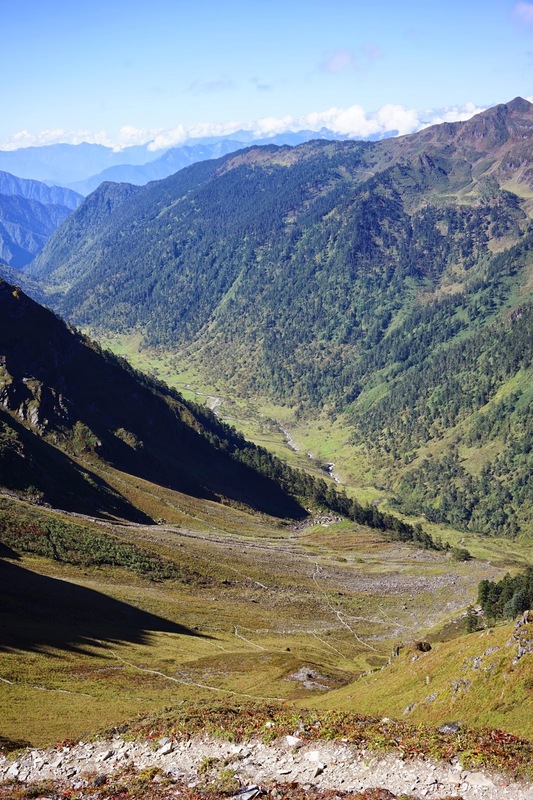 I had been dreading this valley because Chinese trekker blogs said it was full of leeches. However, my guide said this was only during the rainy season (June to September). Leeches were not a problem during dry weather, and when there were no cattle grazing in the valley, he told me. At this point I was expecting that we would have a couple of hours more walking before pausing for the day to stay in one of the stone shelters lower down the valley for the night. I began to wonder why my guide had been in such a hurry as we had already completed most of the day's walking by early afternoon. When we reached the river at the bottom of the valley I expected we would pause for lunch - it was the perfect place to take a break. My guide had other plans, however. As soon as he persuaded the horse to cross a small log bridge he headed straight up the slop on the other side. I tried to call him back, but he ignored my calls. We were still at an altitude of about 3000m and I found it impossible to try catch up with him. When I eventually shouted myself hoarse and got him to halt he was evasive about why we did not stop for lunch. I should have been more suspicious, but maybe the altitude affected my judgement. He told me there was a good place to stop 'just a bit further ahead', and I trusted him. It was now about 1.30pm and I plodded very grumpily up the opposite side of the Sewalongba valley, desperate for a rest and a stop for something to eat and drink. I didn't realise it but I was exhausted and probably dehydrated. After a further 20 minutes walking up though forest with no sign of a rest stop, I rebelled and shouted for a halt. We paused on a featureless part of the trail while I had a drink and ate a few crackers. Then it was onwards again, and I dragged myself up the forest trail like a zombie, assuming that there would be a hut around the next corner. Of course there wasn't. This went on for about 90 minutes until we eventually arrived in a clearing with some derelict cabins and a stagnant pond. It didn't look like a pleasant place to stop, and we didn't. It gradually occurred to my altitude-fogged brain that the guide was planning to climb up to the next pass this afternoon. 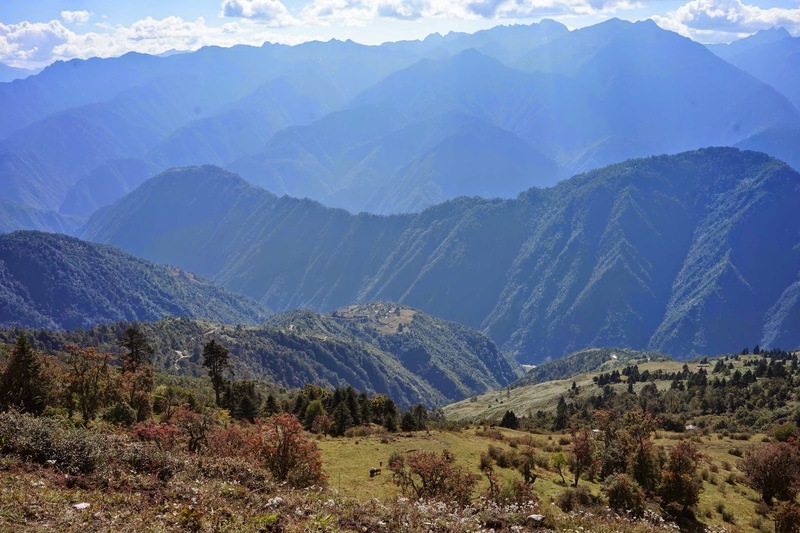 He had no intention of overnighting in the Sewalongba valley and intended all along to turn this pleasant three-day trek into a rushed two-day trip to Baihanluo. I continued upwards, dragging my feet one after another and trying all different breathing 'techniques' (counting breaths, one breath per step, hyperventilating ...) to try keep myself going. The forest thinned out and I realised we were now close to the Bagalong Pass. In a clearing I gained good views back to the She-La pass, which already seemed a long distance away. I wish I had taken more pictures at this point but I was exhausted, grumpy and also believed I would gain better views from the Balagong Pass. I had now accepted that we would make the second pass crossing today and descend to Baihanluo. 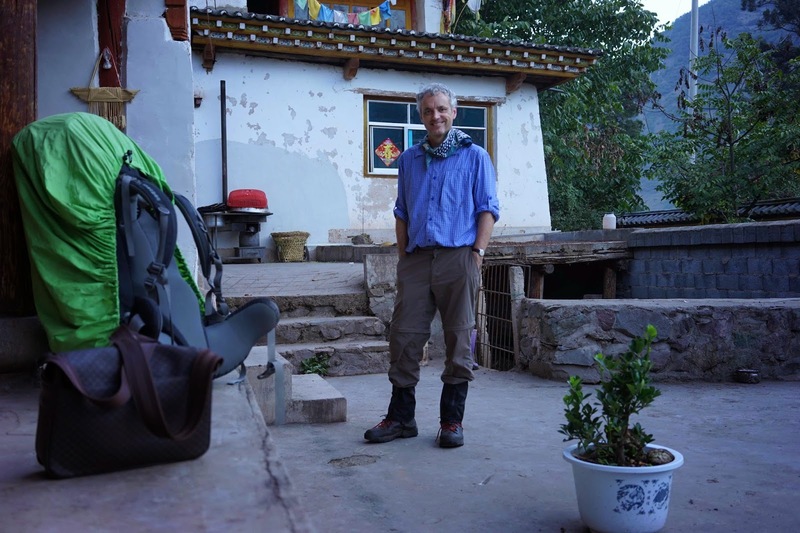 I didn't mind too much as it would give me an extra day in hand to catch up with the trekkers I had intended to link up with further north in Tibet. 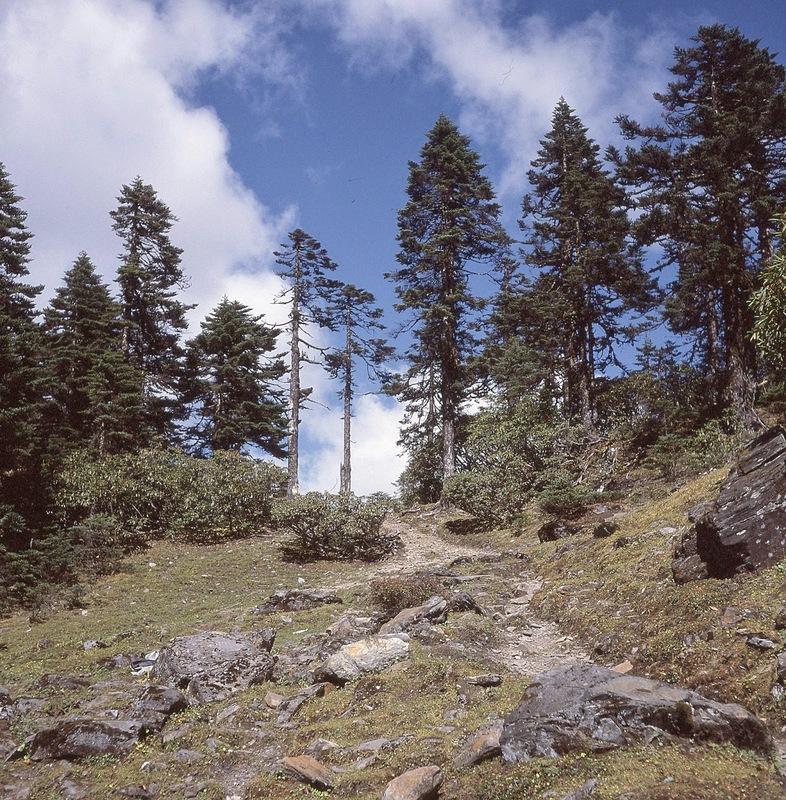 The Balagong (巴拉贡) Pass was an unspectacular high point of the ridge in the midst of fir trees. There were no views in either direction. It is said to be 3950m in altitude. 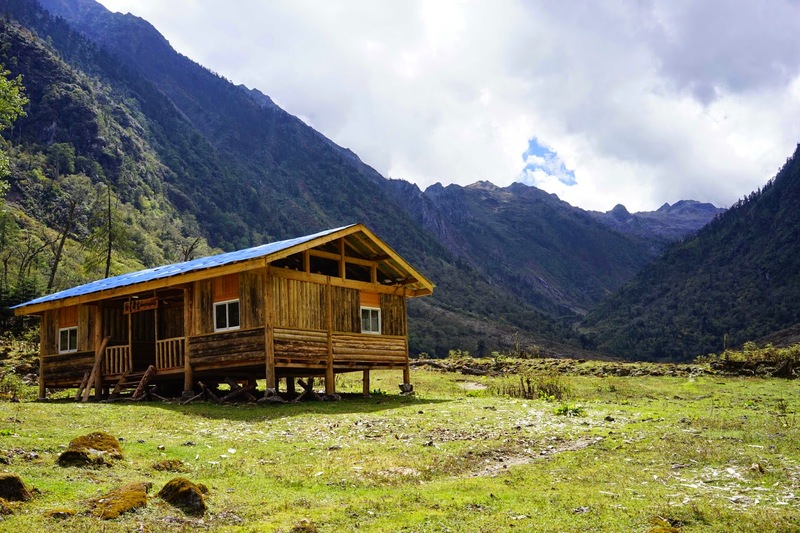 At this point my guide grudgingly admitted that we were going to Baihanluo, not the Sewalongba huts, and I was far too exhausted to argue with him. Descending towards Baihanluo we emerged into alpine meadows where a few horses grazed, and gained views of the familiar multiple ridges of the Nujiang valley. There was even a hint of a view of Baihanluo and other Nu settlements far below. They all looked within easy reach. We walked down across these open grassy areas and my guide suddenly seemed hesitant and unsure of himself. 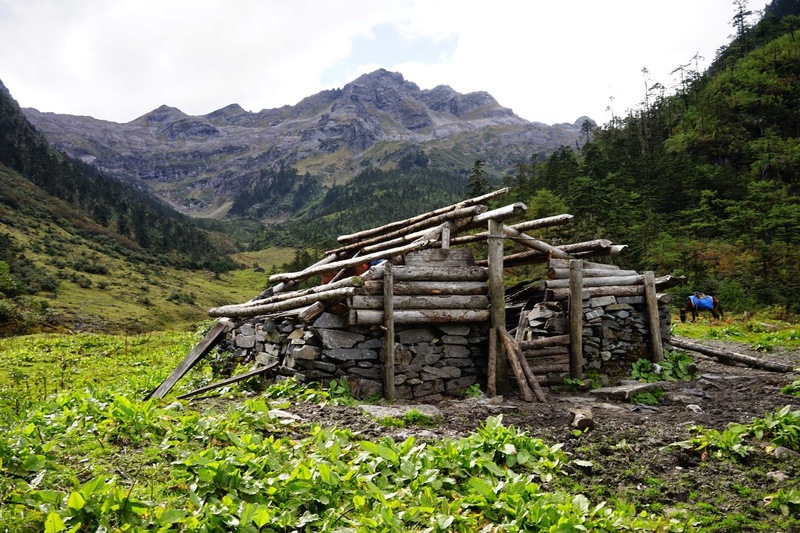 After descending a short way into forest we came across some log cabins that local cattle herders used for shelter. At one of them we paused abruptly 'for tea'. This sudden attention to refreshment breaks was no accident. My guide announced he would not be going any further with me, but was going to return to Cizhong. He was short changing me and wanted his Y1200 fee for getting me from Cizhong to Baihanluo, even though he had done this in two days instead of three. And he had only delivered me within sight of Baihanluo, not to the actual village which was a long way below. The hut was occupied by several of his Tibetan cronies, a really rough-looking bunch and the situation was an obvious shakedown. Pay up or else. Thoroughly fed up with the situation and uneasy at the tense atmosphere, I handed over the money without comment, and walked off alone shouldering my heavy backpack. The guide called after me that it was "only 20 minutes" down to Baihanluo. It actually took me a hellish three hours. The main problem was that the trail became mixed up with many local farmer's tracks. I soon find myself following dead-end trails and paths that led to wooden log cabins that harboured vicious snarling dogs - and worst of all most of these were unchained. The dogs would hurl themselves along the track towards me and start snapping at my legs. Sometimes they would back off or flinch when I raised a hand holding a stone or wielded a stick at them. But some were fearless and aggressive attackers that could only be fended off by vigorous swinging of the stick and loud shouting. Sometimes their owners would emerge from the cabins to call them off, but often these dogs seemed untended and uncontrolled in their attacks. After the first two or three such dog encounters my nerves were frazzled and this just added to my physical and mental exhaustion. I had been walking almost non-stop since 7.30am over 4000m mountain passes and I was absolutely worn out, not to mention thirsty and hungry. I tumbled down the trail, praying that I would soon get to Baihanluo, but it seemed to never get any nearer. I continued to lose my way and find myself bush-bashing around farmsteads and log cabins - or turning corners to find the trail blocked by two or three dogs. I was utterly fed up. Then things turned even more surreal when I was chased by a horse down the track. I heard a sound-effects like whinnying and turned to see a large brown horse galloping down the trail towards me with a strange look in its eye. This was no shy creature, but aggressive and seemingly intent on driving me off the trail. I dodged as it went by, hooves flying, and it skidded to a halt and turned to face me, kicking with its fore hoof, as if to challenge me not to pass. I ducked into the trees and tried to crash my way beside the trail away from the horse. Each time I re-emerged onto the track the horse repeated its charges until I had moved on about a hundred metres. I can only imagine I was invading this horses' territory and it had offspring it was trying to protect. I stumbled on down the trail for what seemed like hours, dodging more aggressive dogs and also slipping and sliding down some sections where the trail seemed more like a steep dried-up water channel than a walking track. It was a tortuous, endless and tedious descent down towards Baihanluo, which I eventually reached at around 6pm, when the light was failing and my legs could barely support me. Bruised, scratched and filthy, not to mention sweaty, stinking and thirsty, I was greatly looking forward to finding a guesthouse, sitting down and sipping a cold beer. 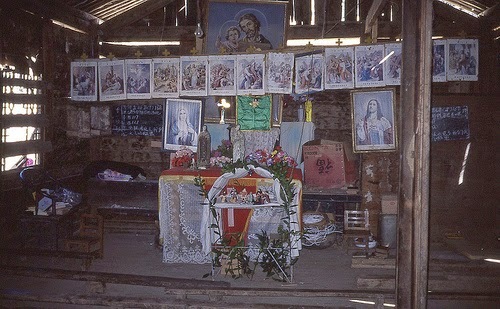 In Rock's time, Bahang (Baihanluo) was a tiny church and mission station overseen by a young French priest, Pere Andre. 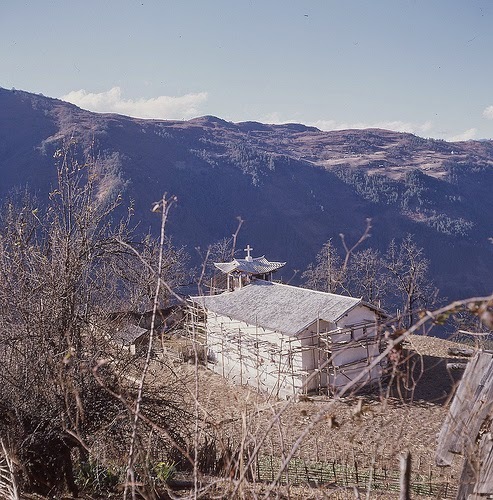 The collection of 18 houses and huts centred around a small wooden church was located high on a hill above the Doyonlongba (Dimaluo) river. Rock described Bahang as "the loveliest mission station of which I know". According to Rock, the mission had twice been burnt to the ground by the Tibetan lamas of nearby Champutong (Bingzhongluo) monastery. 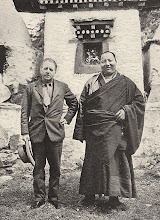 Another priest living in the Salween at the time of Rock’s visit, Pere Genestier, was the only survivor of the 1905 Tibetan massacre of Christian missionaries in the area. Genestier had fled for his life down the valley to seek shelter among the Lisu. His Baihanluo colleague Father Dubernard, was not so lucky. He was killed and his decapitated head put display on the gate of Atuntze (Deqin) lamasery. 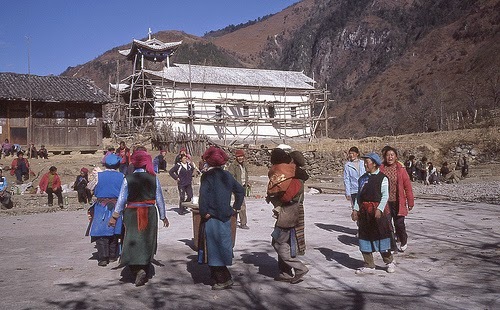 In retaliation for this massacre of western missionaries and their converts, the Chinese burnt down the Tibetan monastery at Bingzhongluo. 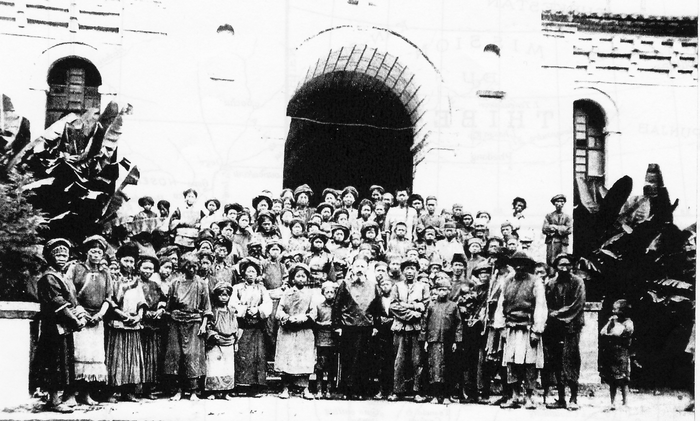 Sectarian strife was common in this little corner of Yunnan in the early 20th century. 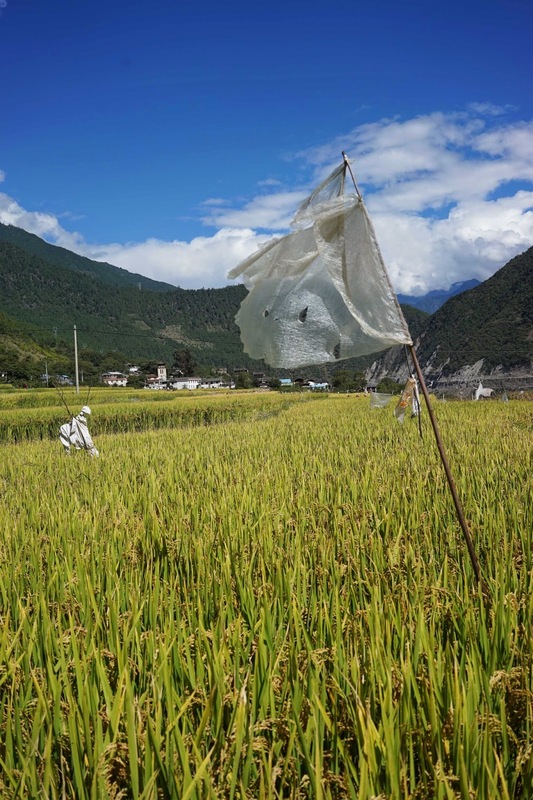 My previous visit to Baihanluo had been at Christmas about four years previously, when the Nu, Tibetan and Lisu inhabitants of this Christian village were all out in the square by the church celebrating by imbibing their alcoholic maize-based shuijiu. I travelled there at Christmas 2008, during a bus trip up the Nujiang valley. 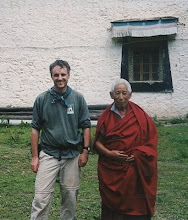 I stayed at an eco-trekking lodge in the village of Dimaluo, run by a local Tibetan Catholic called Aluo. Dimaluo was in the valley below Baihanluo, and on Christmas morning I set out to walk the two hours up thrugh the forested hills along a track to Baihanluo. Somewhat out of breath, I arrived at the church, in front of which the locals were were sitting in groups around the basketball court. They were already enjoying a bit of Christmas cheer. In fact they were enjoying a lot of alcohol, in the form of the shuijiu corn liquor that was being dispensed from a big plastic barrel. Everyone seemed to be drinking the stuff – male and female, young and old. Groups of villagers sat around the white church, chatting and laughing. We were welcomed and given shuijiu in dirty plastic mugs that someone found for us. And thus we ‘mingled’, holding our drinks self-consciously as we circulated, chatting and taking photos. It felt odd to be celebrating Christmas in the sunshine in a remote Christian corner of the Nu River Valley, but unlike most parts of China it certainly felt like Christmas. 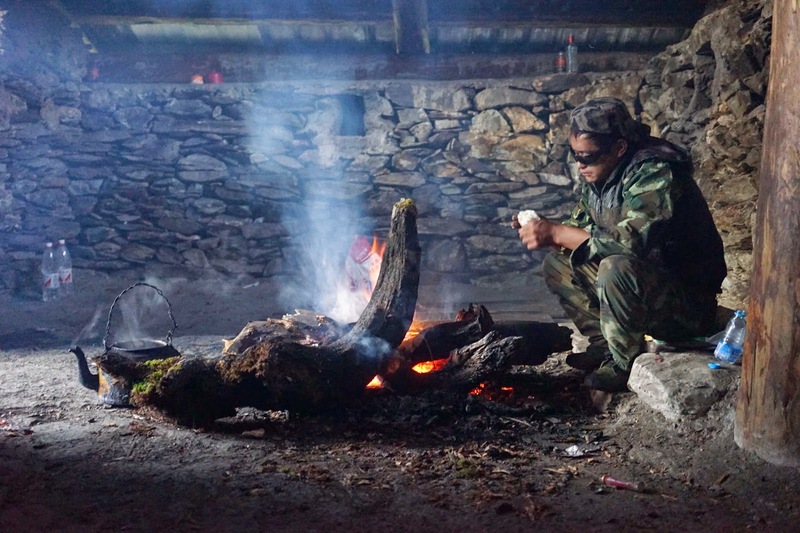 The locals were friendly and unassuming, but also rather simple – if not primitive. Their love of a drink was something that Rock had noticed. 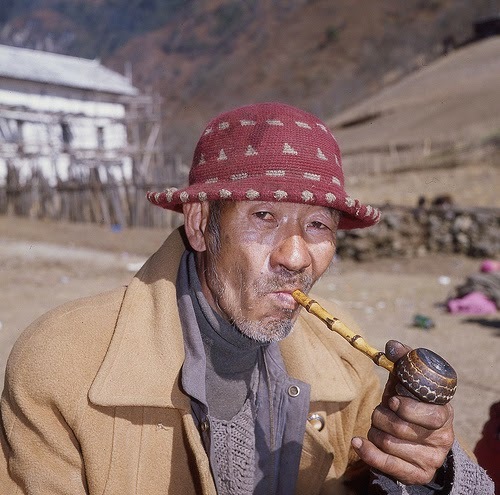 The “Lutzu” people he encountered in the Salween (Nujiang) valley he described as a poor lot who subsisted on corn, even using it to make liquor “of which they drink a great deal”. We had a brief tour around the church, which was under renovation. Unfortunately, it seemed that the beautiful old murals and decorations were being touched up or even painted over. From a distance, the white church looked quaint and graceful. Once inside, however, it looked rickety and draughty. Built almost entirely from wood, the Baihanluo church was spartan, dusty and the ill-fitting planks left lots of gaps letting daylight in through the walls. There were just a few rows of simple planking seats and no other fancy trimmings. The altar, however, was decorated with all the trapping of Catholicism familiar to me from Christ the King church in Leeds: the Stations of the Cross, a tabernacle, the statues of Mary and Joseph, and even a home made nativity display, complete with little figures of the baby Jesus being visited by the Three Wise Men. It was all oddly reassuring and homely in this otherwise remote spot. There was no priest in evidence, and the Baihanluo people said their service – like the one in Dimaluo – had been held the previous evening. We tried to find out more about the place but most people seemed out of it and more interested in getting sozzled and having a dance. “We enjoyed the hospitality of Father Andre, who freely shared his vegetable garden and his larder with us. 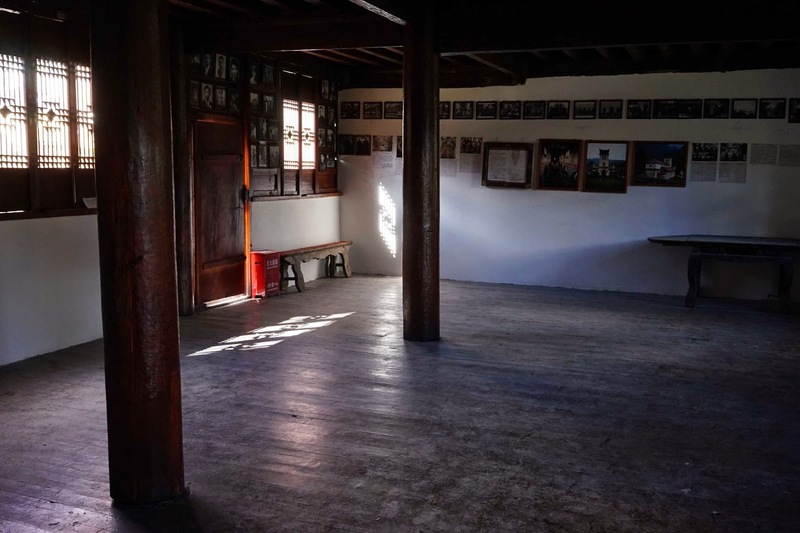 It was hard to say goodbye and leave him to wrestle with the coming winter, surrounded by primitive Lutzu,” wrote Rock of his stay here in 1923. I could almost say the same about Baihanluo in 2008, but it was the local Tibetan Aluo whose hospitality we had enjoyed and who freely shared his vegetable hotpot with us. Joseph Rock makes only a passing mention of Dimaluo (Doyonglongba) in his articles on the Great River Trenches region, when he passed through on his way from the nearby Baihanluo (or Bahang as he called it) mission station. Nevertheless, it was one of the highlights of my visits to the Nujiang, mainly because of the amazing hospitality of the gentle Aluo. 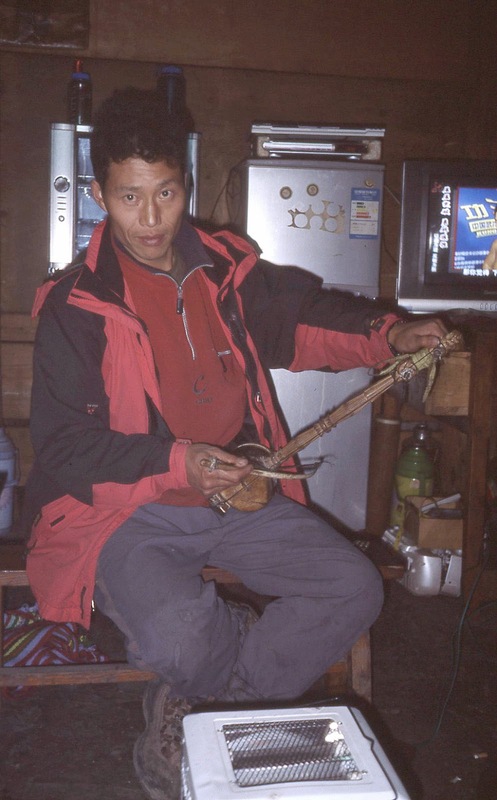 He is an ethnic Tibetan Catholic who lives in the village and runs a trekking lodge. 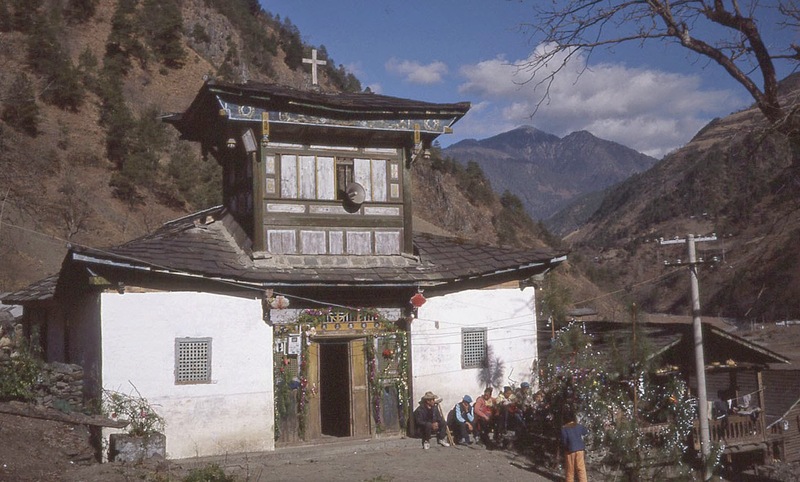 As with Baihanluo, the focal point of Dimaluo village was a beautiful wooden Catholic church built in a local style. 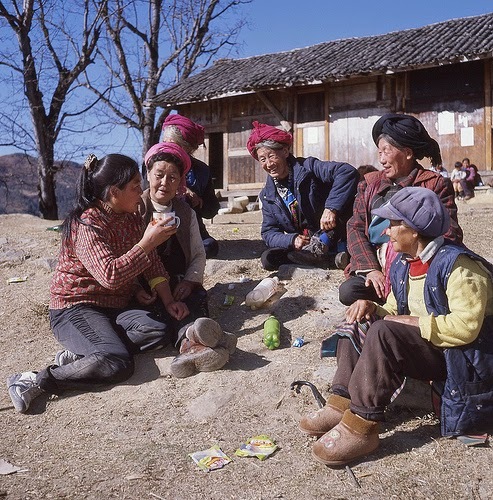 As everywhere else in the Nujiang, the local people we met were very friendly. They were mostly Nu but with some Tibetans. On Christmas Eve we sat down to dinner with Aluo and his family in their cosy but dimly lit living room. Before we could tuck in to the hotpot of local vegetables, Aluo insisted that we say grace before the meal – “Bless Us O Lord for What We Are About To Receive...” something I hadn’t done since my Catholic school days. It was here that we also met two other foreign visitors – a couple of young Chinese-American women. One was on Christmas break from working in Shanghai in public relations. 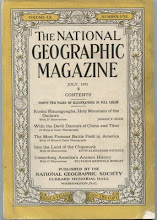 The other was doing academic research into water usage and had already spent a few weeks in the Nujiang area. She told me that the dams were being built on the Nujiang despite an official ban by the central government in Beijing - the provincial government was quietly going ahead with them anyway. And the dams would not benefit the local people: the power was to be directed into the national grid, to for China’s energy-hungry coastal provinces. 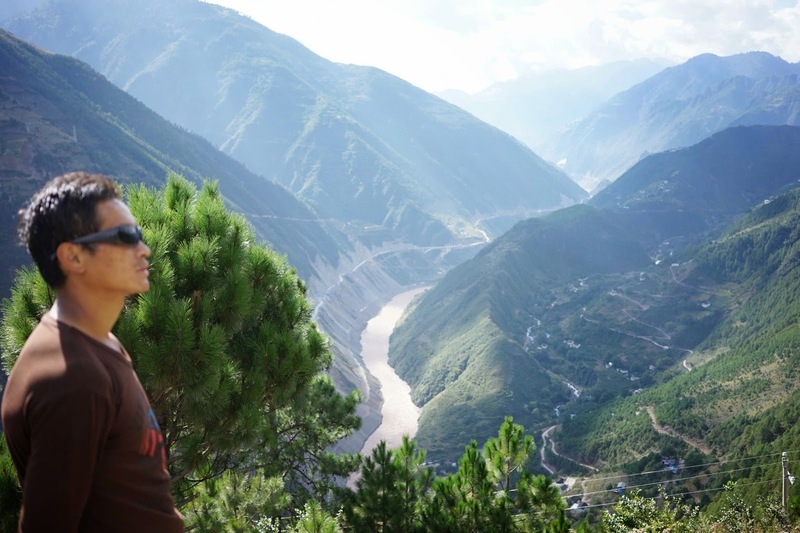 Aluo told us that a road was currently being constructed over the mountain divide to connect this part of the Nujiang valley to the Mekong and thus end the area's dead-end status. 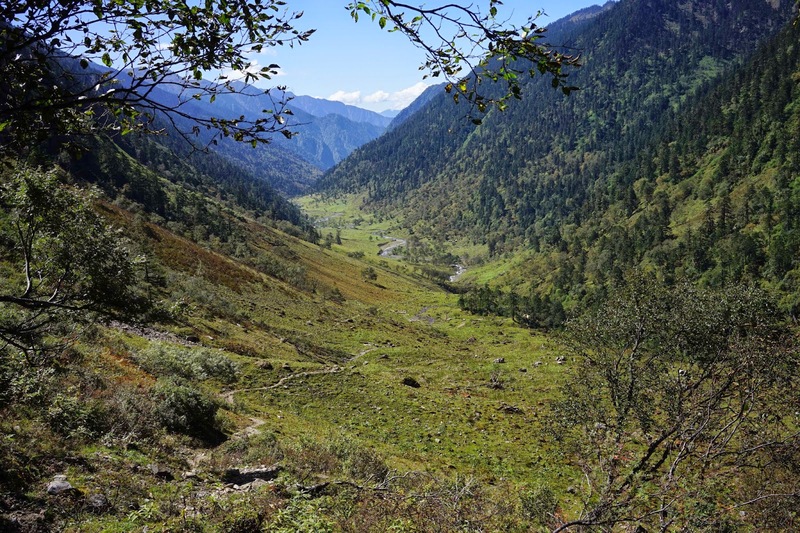 When the road between Dimaluo and Chalitong was complete, it would do away with the two day trip to reach the Nujiang via Liuku, far to the south. 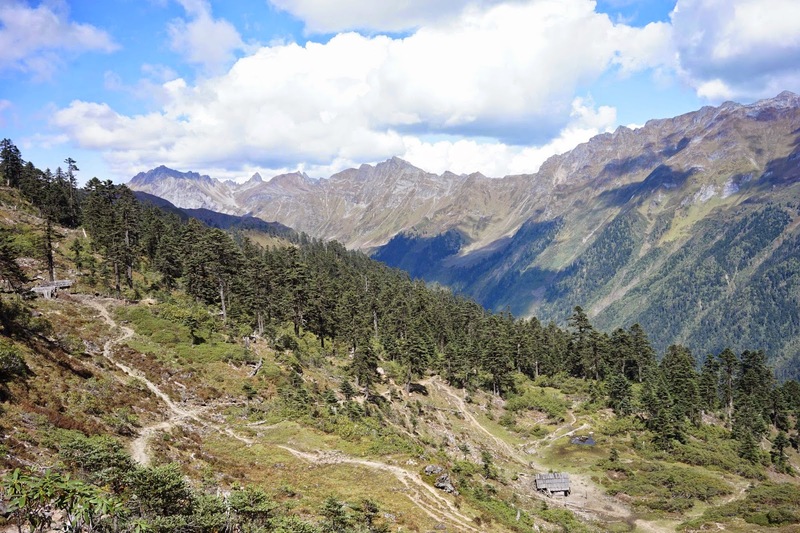 The Nujiang valley would be opened up to traffic from Deqin and life would never be the same again. After dinner we sat around, trying to drink the alcoholic corn liquor shuijiu. Many of Aluo’s extended family, friends and neighbours dropped by for a singsong, a chat and to strum the guitar or surf the net on his computer. Even here you couldn’t escape the web! Later on, I walked up to the Dimaluo church to see the midnight mass. The church was full, with women kneeling on the left-hand side ‘pews’ and men on the right. There was no priest, and the service was conducted by a lay preacher. 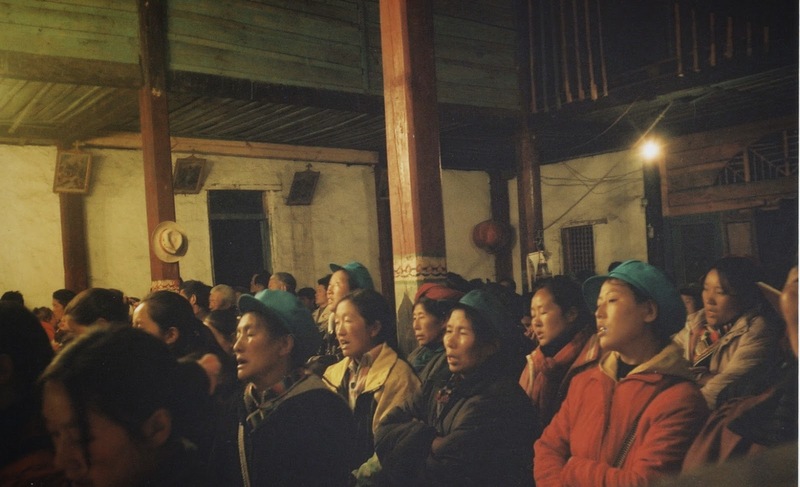 Under the yellow light of a few weak light bulbs the congregation sang hymns and chanted prayers in a Tibetan style. It sounded very similar to the kind of Buddhist religious chanting I’d heard in Tibetan monasteries – only this time it was peppered with words such as ‘Yesu’ – and finished with ‘A-men’. It was a dark night and when the stars came out overhead it all felt very enchanting and Christmassy. With thoughts of the New Year, I was already looking ahead to 2009 and my next attempt to 'do' the Doker-La pass. I was looking into doing this hike later this year with my girlfriend and no guide. Most people over the internet say you need a guide but based on your account, it seems like something you could do without a guide if the weather was good. In fact it looks like you were on your own most of the time anyway! I have been looking on Google Earth and using an Open Andro Map that has the whole route mapped and even includes the locations of the shelters along the way. 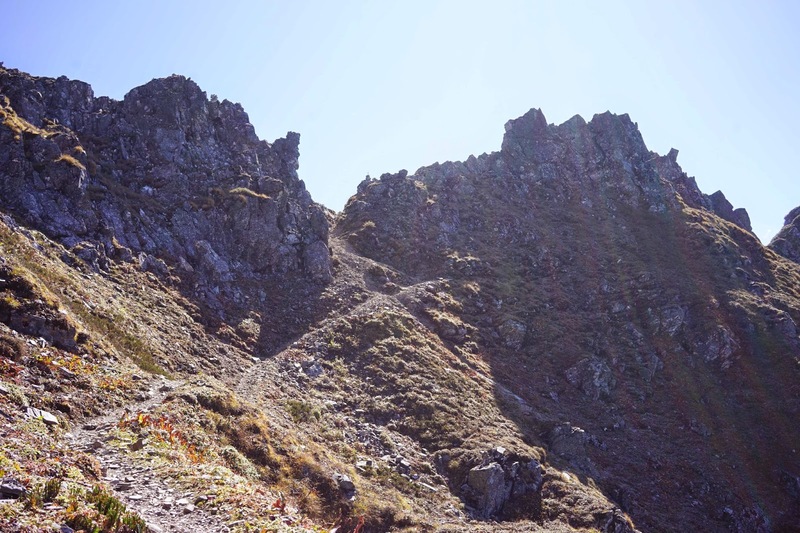 You probably could do it without a guide, once you find the right trail above Cizhong (follow the water pipes up till you hit the dirt track and go right). I would recommend a guide if only to carry bags and help in case of meeting any unfriendly locals. Not sure what the rules are about the shelters but some of them are deemed to be 'private lodges' and you might get into misunderstandings with local people. I was lucky with the weather but many of the (Chinese) blogs I've seen have described mist, ice and even snow on the pass. I think it would be snowed in from Nov-April/May. Good luck.